Captain Laura Brooker sent a beautiful shot top corner and Danelle Im and Megan Howe complimented her as the Wilfrid Laurier Golden Hawks women’s hockey team defeated the UOIT Ridgebacks 3-1 Wednesday evening. 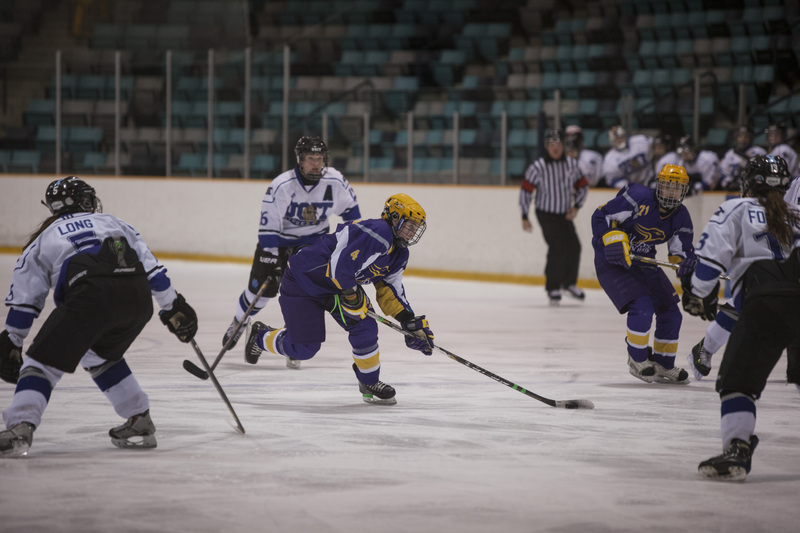 In the first game of the best-of-three series in the first round of the Ontario University Athletics (OUA) playoffs, Laurier scathed away a win despite not putting on their best performance. “We were confident going in and we’re confident coming out as well. We knew [UOIT was] going to come out hard and it’s a new season for them, so we didn’t take them lightly,” Brooker said after the game. In a very safe first period in the opener of the playoffs, it wasn’t until less than four minutes left in the frame that Brooker beat UOIT goaltender Tori Campbell top corner to put the Hawks ahead by one. While Laurier dominated the shots in the first period, putting up 14 to UOIT’s six, the Ridgebacks were able to take advantage of the mistakes the Hawks made in the second. Midway through the second, Im would beat Campbell to put Laurier comfortably up by two. However, UOIT consistently put on pressure and fifth-year Jill Morillo would beat first-year Smith top corner to cut the lead in half. But Smith, in her first career playoff game in the OUA, stood on her head to keep the Hawks ahead by one heading into the intermission. “It makes you want to block the shots for your goalie. So everyone’s putting in the extra effort and it’s great to see her throwing her body around for anything and everything,” Brooker said of the rookie netminder. In the third, despite consistent pressure from the Ridgebacks, Laurier found a break when a point shot from Candice Styles was tipped by third-year Megan Howe to put the Hawks comfortably ahead by two. Despite UOIT pulling Campbell for the final two minutes of the game, Laurier held on to solidify the game one victory. Laurier will now travel to Oshawa on Saturday for game 2 of the best-of-three series. If Laurier wins, they will be off until potentially Wednesday. If UOIT wins, the series will come back to Waterloo on Sunday evening. Game times are all 7:30 p.m.